One of the most radical feminist theorists in Europe before the nineteenth century, François Poullain de la Barre (1647-1723) was a man way ahead of his time. Applying Cartesian principles to "the Woman Question," Poullain demonstrated by rational deduction that the supposedly "self-evident" inequality of the sexes was nothing more than unfounded prejudice. Poullain published three books (anonymously) on this topic in the 1670s, all of which are included in English translation in this volume. In On the Equality of the Two Sexes he argued that the supposedly "natural" inferiority of women was culturally produced. To help women recognize and combat this prejudice, Poullain advocated a modern, enlightened feminine education in On the Education of Ladies. Finally, since his contemporaries largely ignored Poullain’s writings, he offered a rebuttal to his own arguments in On the Excellence of Men—a rebuttal that he promptly countered, strengthening his original positions. 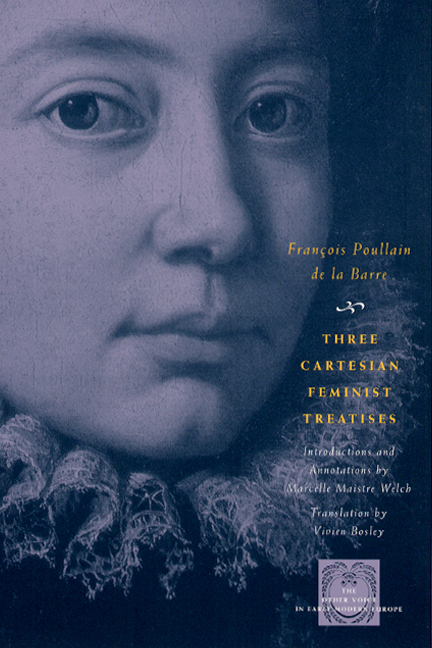 A truly modern feminist, Poullain laid the intellectual groundwork for the women’s liberation movement centuries before it happened. Introduction to the Series, by Margaret L. King and Albert Rabil Jr.